The spiral is an ancient symbol of the Universe and the relationship between Life and Death, Humanity and the Divine, Involution and Evolution, and can be found in most cultures including Celtic and Maori. The Paua (NZ Abalone) shells are hand-shaped from Paua collected on the shores of southernmost New Zealand. They are their natural colour and the edges have been sealed to prevent flaking. 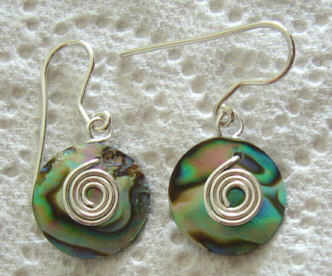 The Fine Silver spirals and Sterling Silver ear-wires are handmade on the premises. Also available on long "lemon" loops - see previous for style.